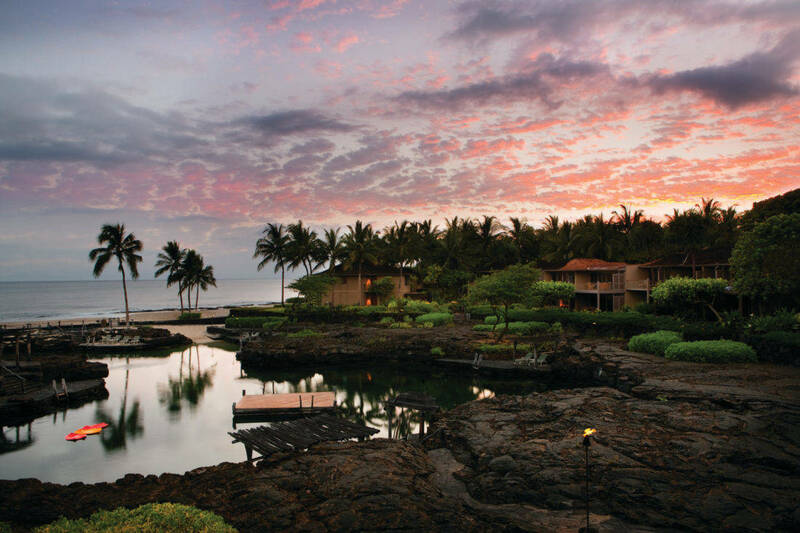 Our favorite family destination is Hawaii, and one of my family’s top choices for Hawaiian travel is the Four Seasons Resort Hualalai. We have visited the property a few times, and during one memorable visit in mid-December— before the holiday rush— we felt like it was our own private island paradise for the week. The hotel sent someone to collect us at the Kona airport— which is an entirely outdoor airport. My children were so excited, and the hotel driver was very informative and answered their many questions about the island. Hotel staff greeted us with leis and a tasty Hawaiian drink. We were ready to go offline and relax as a family for the whole week. We had originally booked a standard room and were told it would accommodate four people with its pull-out couch. We ultimately upgraded to a suite to enjoy privacy and closing doors between our bedroom and living area. We loved our suite with its enormous closet, and I thought it was a sweet touch when I opened it to see two child-sized and two adult-sized robes. I also loved soaking in the enormous tub and the kids loved the outdoor shower. The bathroom and closet area was large enough for me to escape to when this mommy needed some alone time to read at night. We love lying on the beach with our kids on vacation and were very happy with the pampering poolside service. In addition to wonderful food, the staff come by each day offering complimentary sunscreen, fruit, sunglass cleaning, and ice cream. The lounge chairs felt like beds; one could choose to be completely shaded or exposed to the sun. There is also an adults-only pool that we used when our kids were at the Kids for All Seasons but we found the main family pool to be just as nice, a testament to the relaxed vibe here. There is also a baby pool with sand for toddlers. Share their beach with amazing sea turtles. It doesn’t get better than this for relaxing poolside. We never left the property during a week-long stay, so we tried every food option. For breakfast we ate at ULU where they serve a buffet or full menu. I loved the omelette with smoked salmon and avocado. We were traveling with friends who bought food in the sundry store and ate that for breakfast before joining us for ULU’s complimentary tea and coffee. ULU is appropriate for children of all ages for breakfast; at dinner, it is a little quieter— but still okay for kids. There is also a very good steak restaurant, Hualalai Grille, that we enjoyed with our children. My son liked that the bar had televisions so he could watch sports from our table. The Residents’ Restaurant is also open to hotel guests, and they were very accommodating to our kids, but it is a very quiet and romantic place, so I would not take a squirmy toddler. So, you might ask, where do I take my squirmy toddler? Well, they have a very nice casual restaurant, Beach Tree, where live musicians play each night and I spied many a toddler dancing to the ukalele. This is our Weekend at Bernie’s moment. 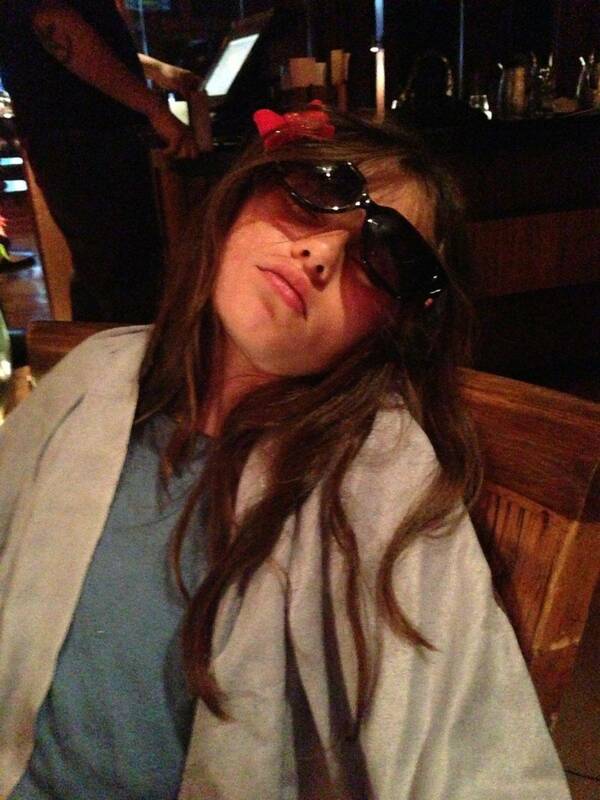 The Little Lady fell asleep while we dined at Hualalai Grille on the last night. Sunglasses provided by younger brother. My kids mostly just hung out with us, and we enjoyed walks on the beach (there is a terrific ocean front walk that is doable for kids). One benefit of the walk is that you will see many large turtles sunning themselves. Our kids also enjoyed Kings Pond (the water is a little chilly) but they can snorkel in the safety of a closed ecosystem versus being in the great ocean. We fed the rays almost every day because we enjoyed it so much. There are also different Hawaiian cultural classes for both adults and children. My daughter took lei making but we missed the dancing class because it filled up. Book that one in advance! Kids for All Seasons, the Four Seasons kid program, is complimentary and accepts children 5 to 12 years old. The counselors are really sweet and accommodating with entertaining and educational programs. They take the kids to Kings Pond for a fish feeding, to the pool and on walks. For an additional fee your kids can canoe or rock climb. The kids’ center also has video games, televisions, board games, fooz ball, and pool table. You can also order food for your kids to each while there and the staff will make sure if they eat it. Our children had dinner with us nearly every night, but we needed to hire a nanny the night of a wedding we were attending. (The kids club closes at 5, and the wedding started at 6 pm so babysitting was really our only option). 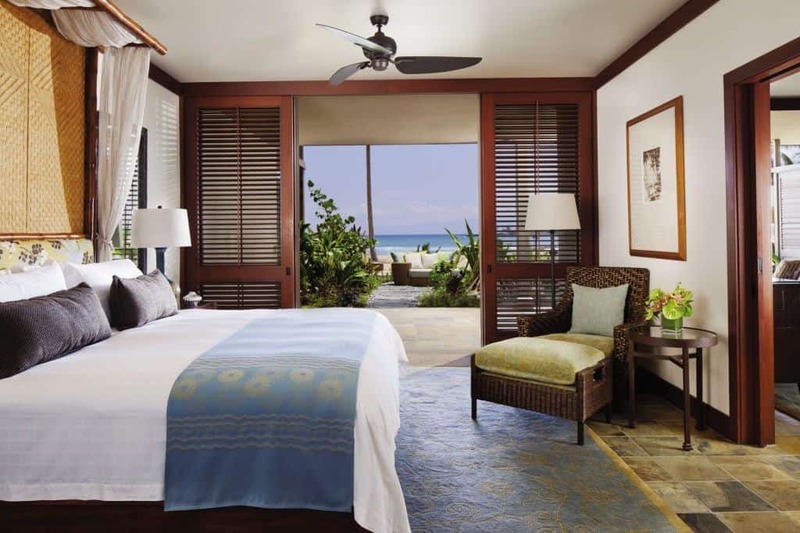 We used Big Island Nannies and were very satisfied. Our friends had toddlers and were also very pleased with the nannies they were assigned. A Kids for All Season excursion in the pond. Feed the rays every day. The resort offers an outstanding array of spa, fitness, and health options—practically rivaling a destination spa. In addition to the standard luxury spa menu, you can book acupuncture, yoga therapy, and energy healing appointments. For fitness, beyond the well-stocked gym, you can arrange private Pilates reformer and yoga sessions, personal training, spinning, and Barre Fusion classes. It is clear the resort wants to help you maintain whatever routine you do at home for exercise. A family’s stay can be so comfortable. The resort has laundry machines throughout the property so you can wash out your kids’ clothing, and the beach has a sea wall so that kids can swim in the ocean without big waves. That being said, some might not appreciate the beach at this property because you cannot surf or body surf. This is a mellow beach made for relaxing. Turtles are a common site on the beach. I was told this one outweighs me by 50 lbs but am not convinced. The sunsets are so magical that even a smartphone can take a picture like this. SO beautiful. Looks amazing. This article is super informative. I look forward to my own family adventures and experiences at this resort! This is one of my favorite places on earth ! Love reading about your writers experience ! I will defiantly be back !